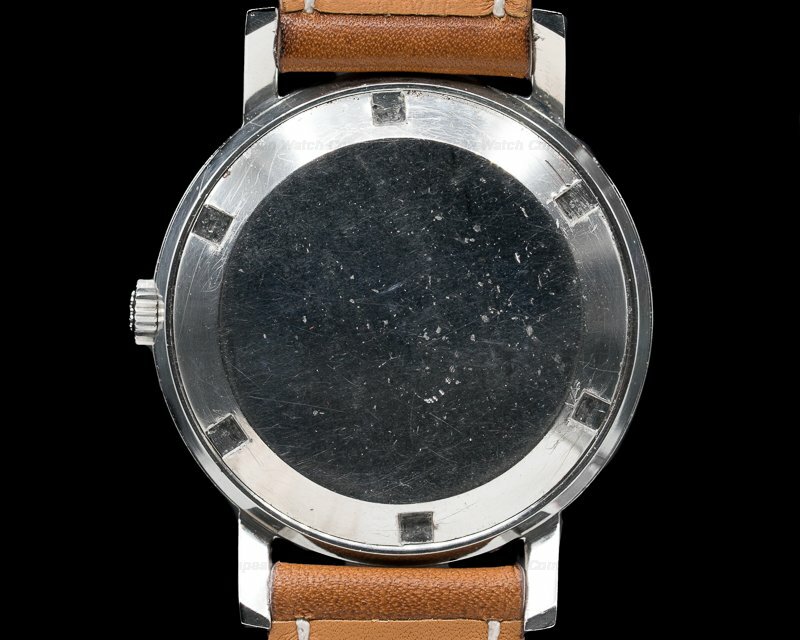 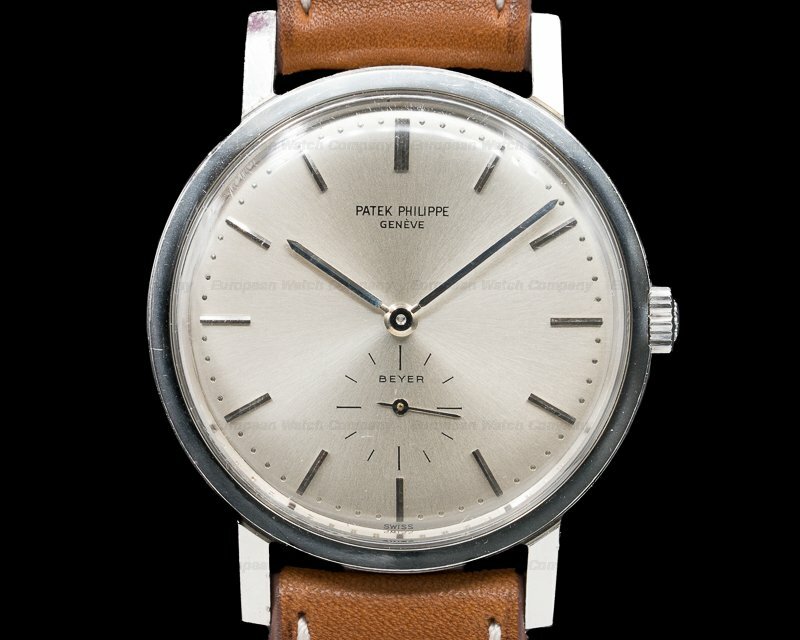 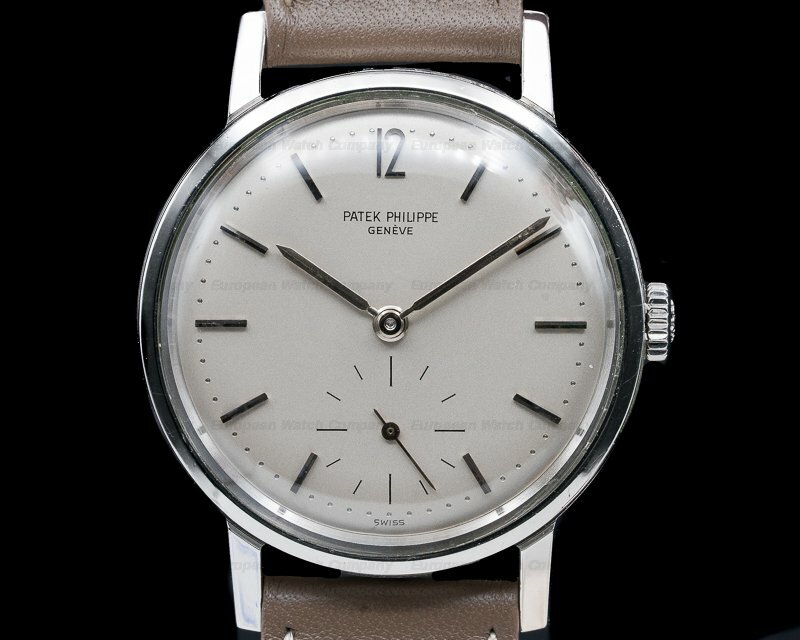 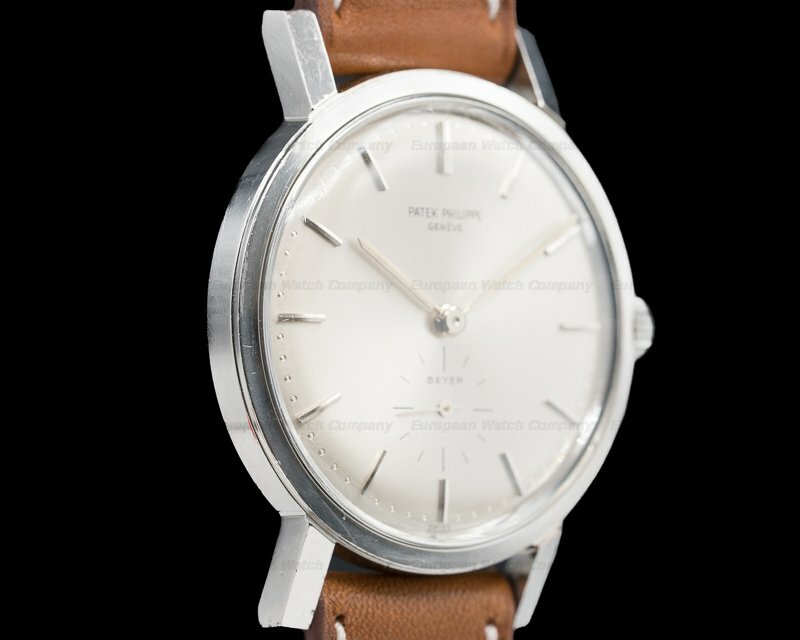 This is a vintage 1962 stainless steel Patek Philippe 3466 Calatrava, It has an alligator leather strap with a PP&Co stainless steel tang buckle, and an acrylic crystal. 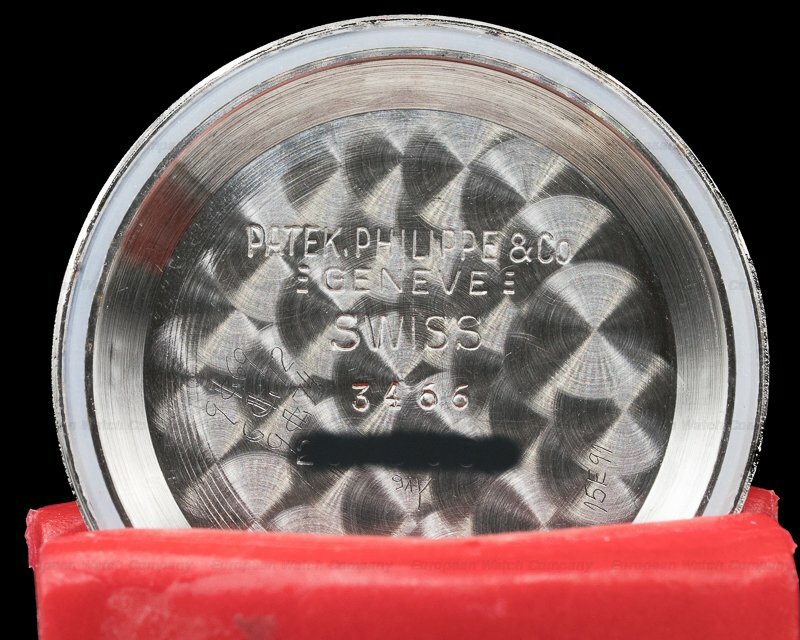 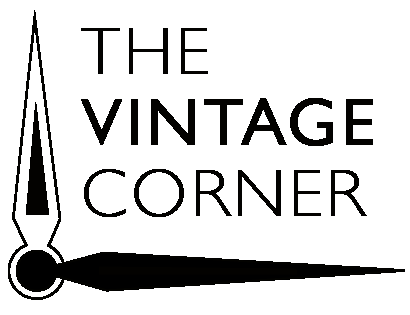 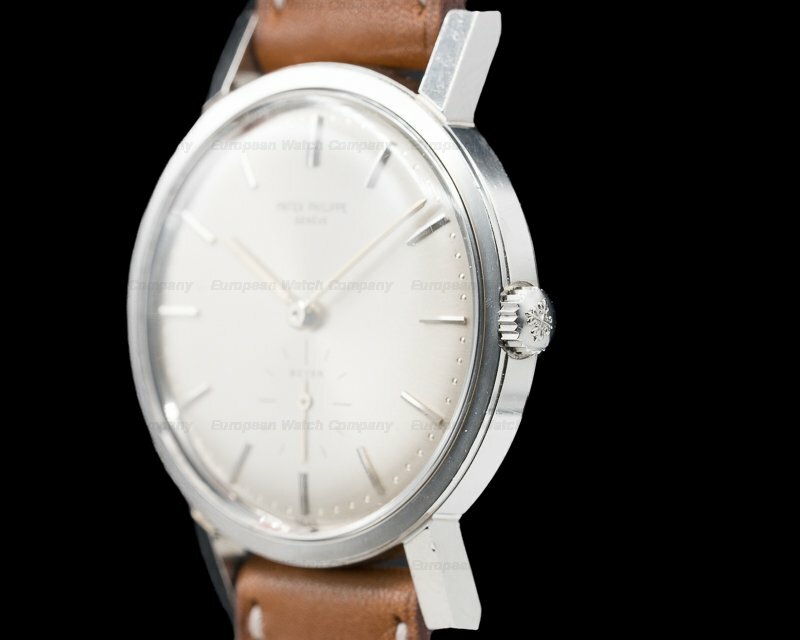 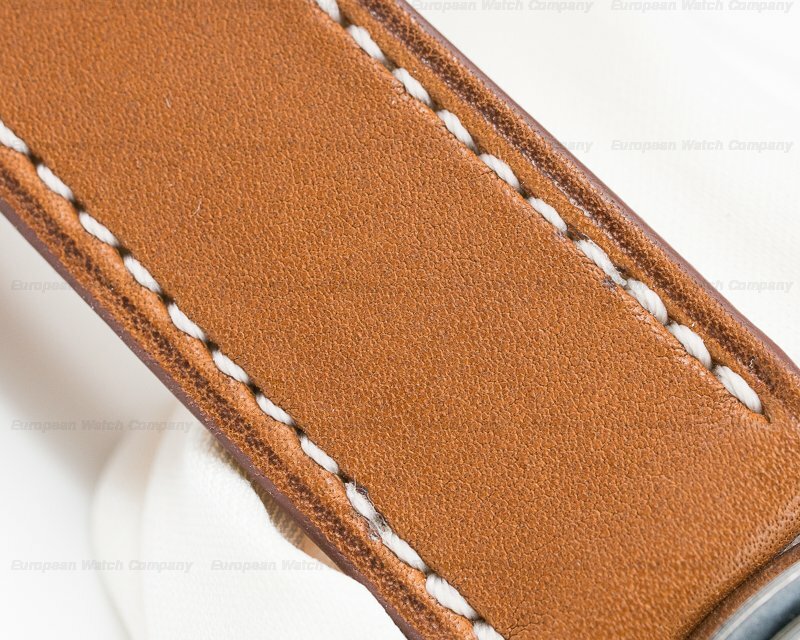 There is a pull out winding crown and a solid screw down case back, inside of which is engine turned and stamped "PATEK PHILIPPE & CO – GENEVE – SWISS – 3466," and a serial number. 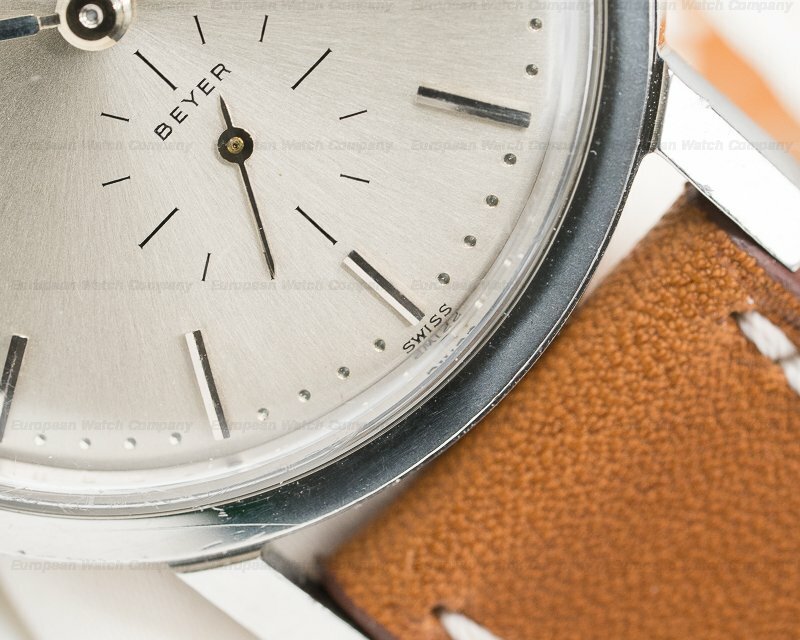 The 35mm diameter solid two-body case, downturned lugs, and thin flat bezel, are polished. 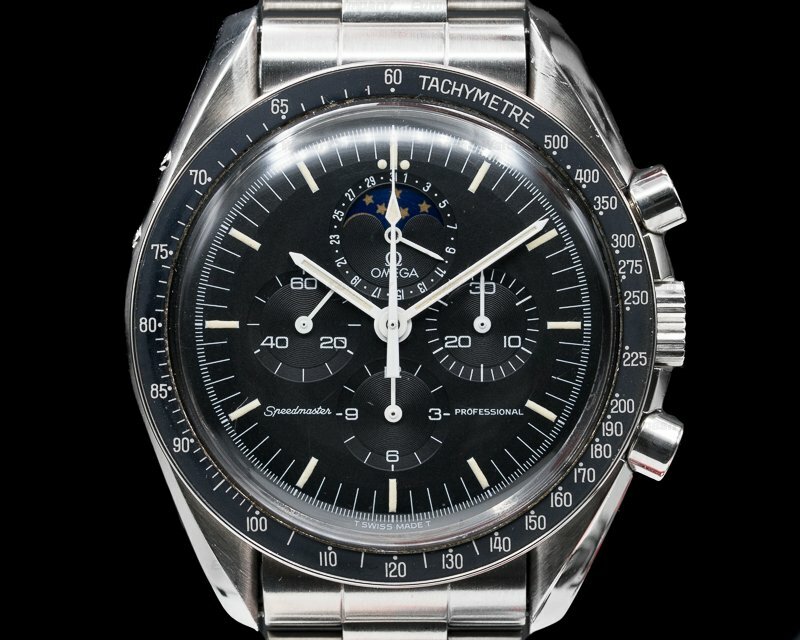 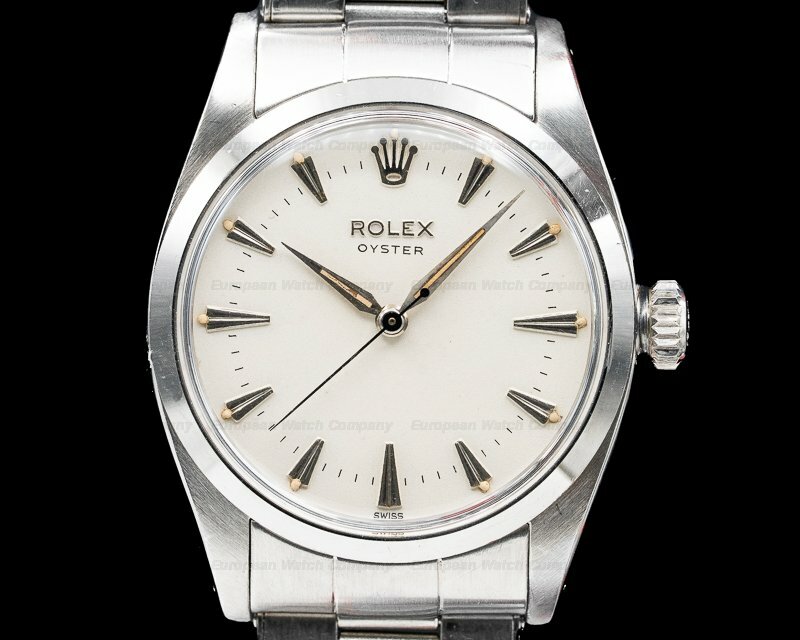 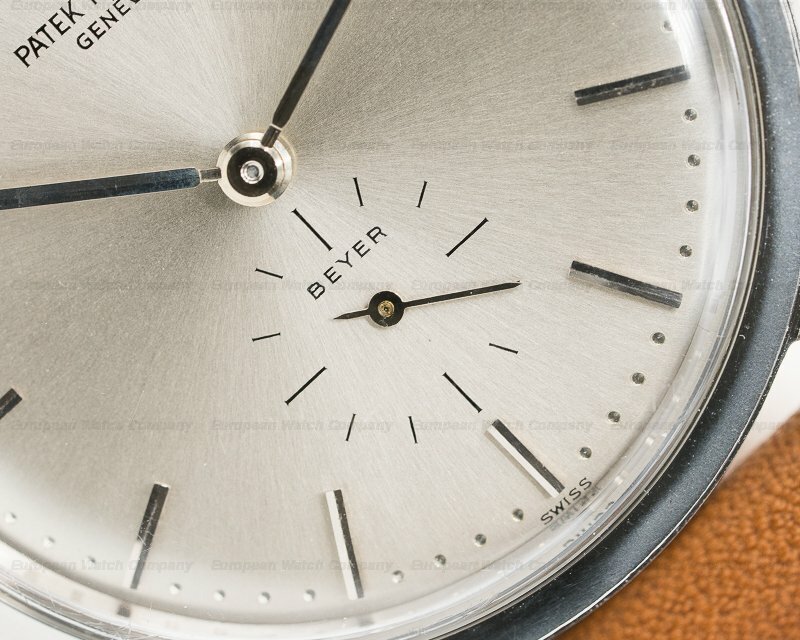 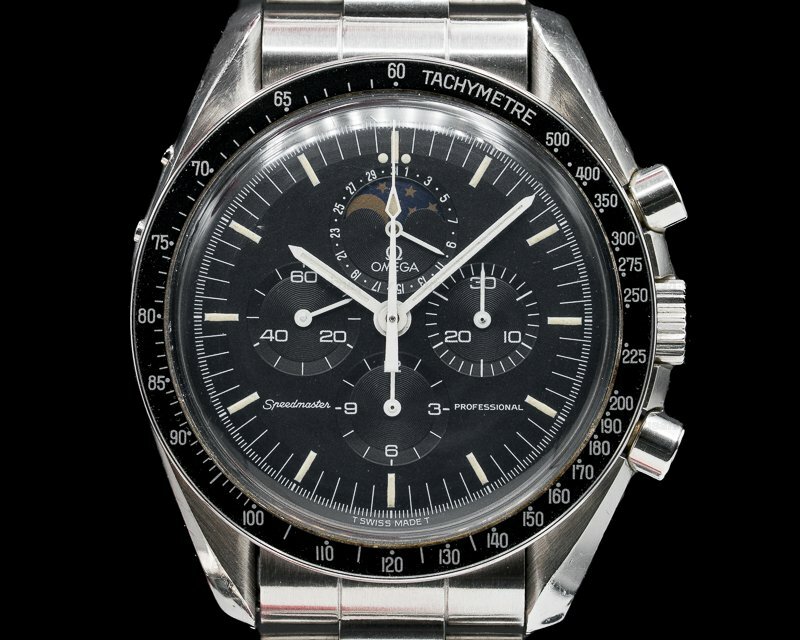 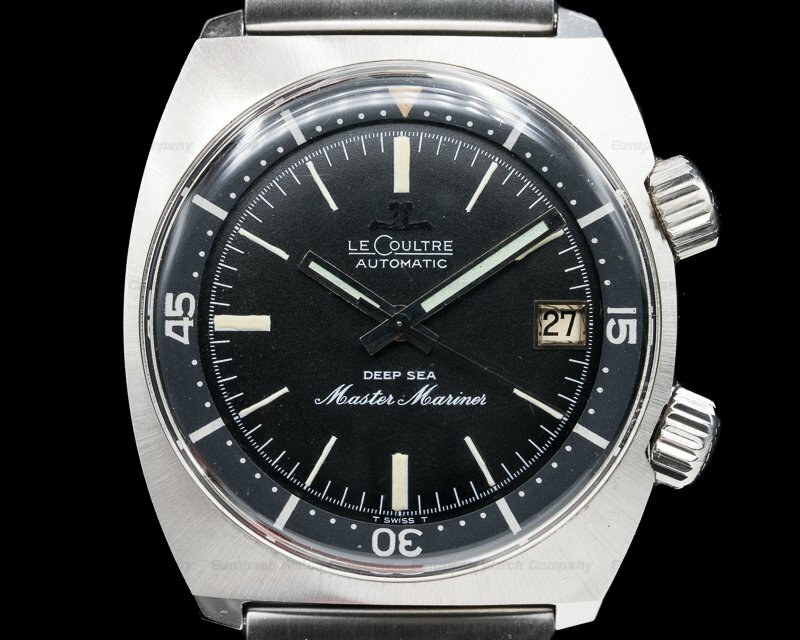 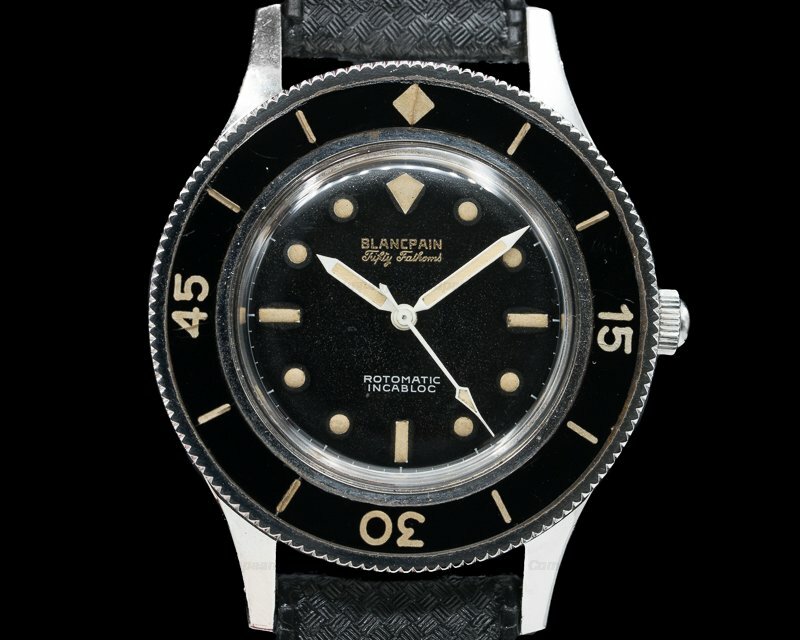 It has the original silver dial with applied faceted steel baton hour indices around a perimeter dot minute scale. 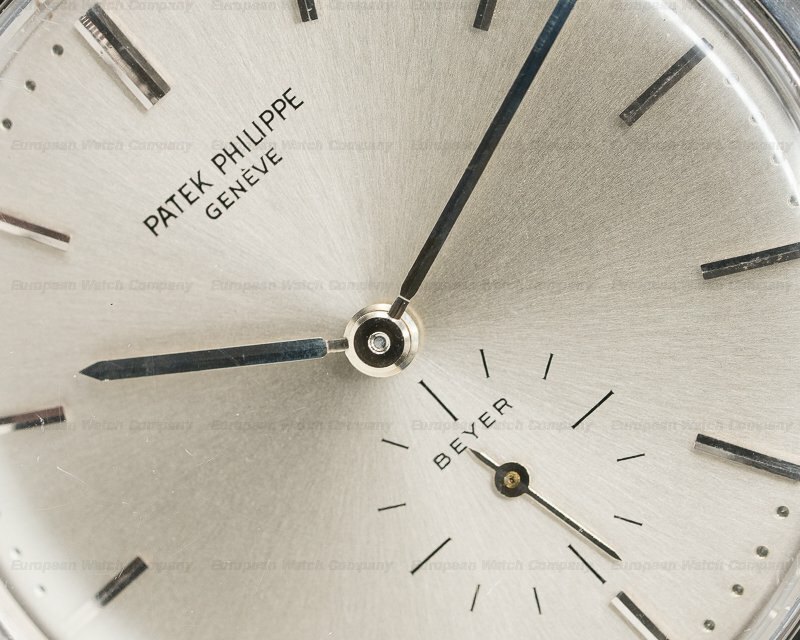 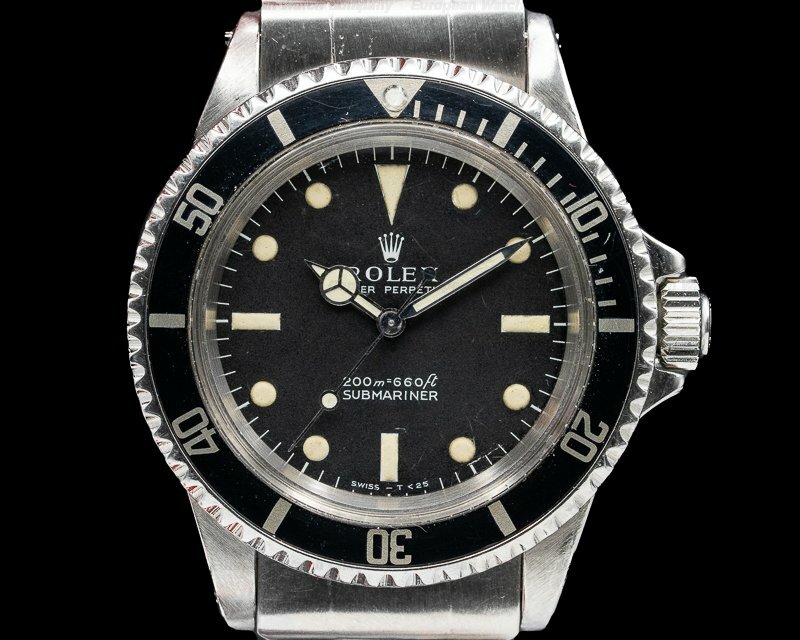 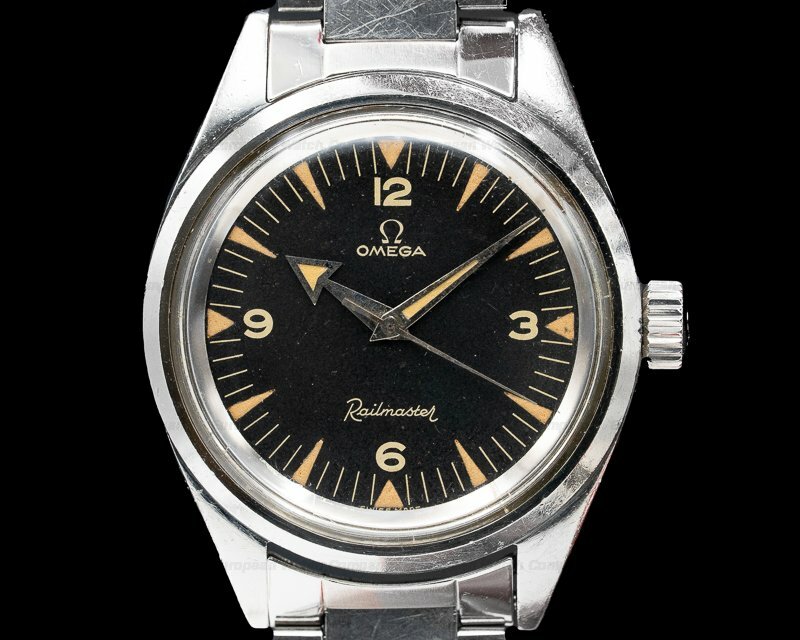 It includes pointed steel baton hands, and there is a silver running small seconds subsidiary dial with black markers and a steel indicator hand at the 6 o'clock position. 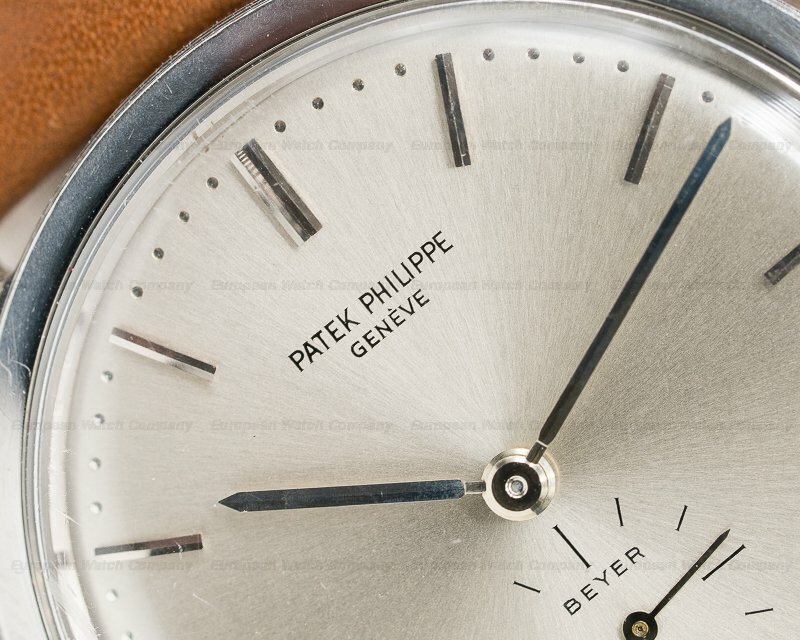 The 10.5mm thick case, dial, and movement are all signed. 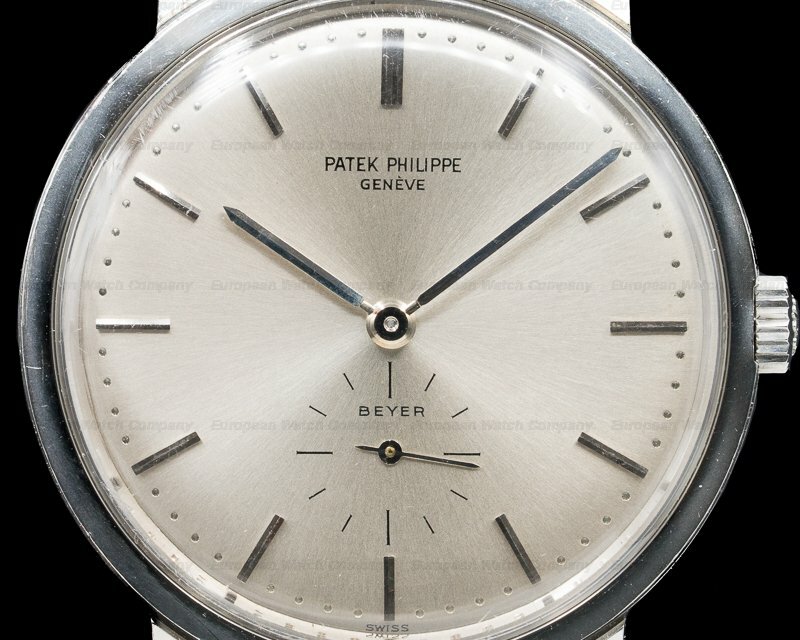 This Patek Philippe 3466 Calatrava has a mechanical self-winding automatic Patek Philippe Caliber 27-460 movement that's rhodium-plated, with Cotes de Geneve embellishment. 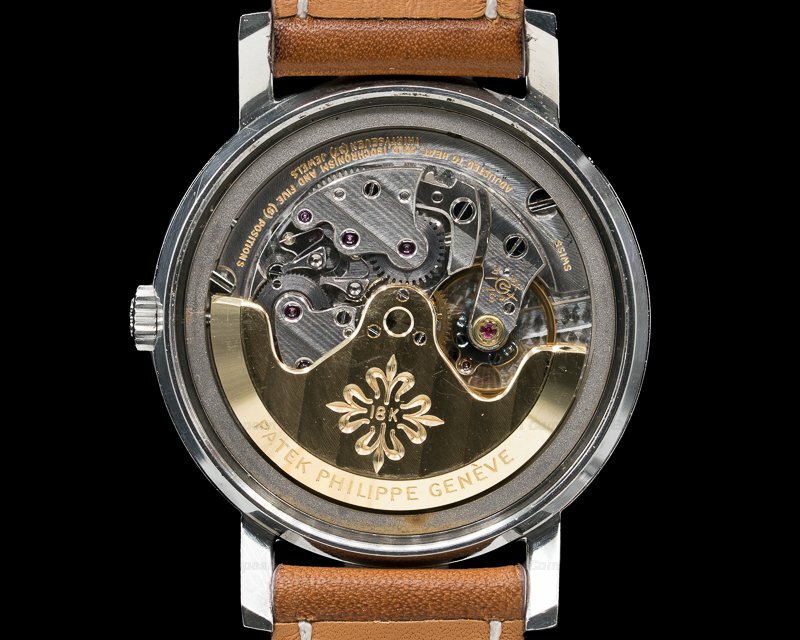 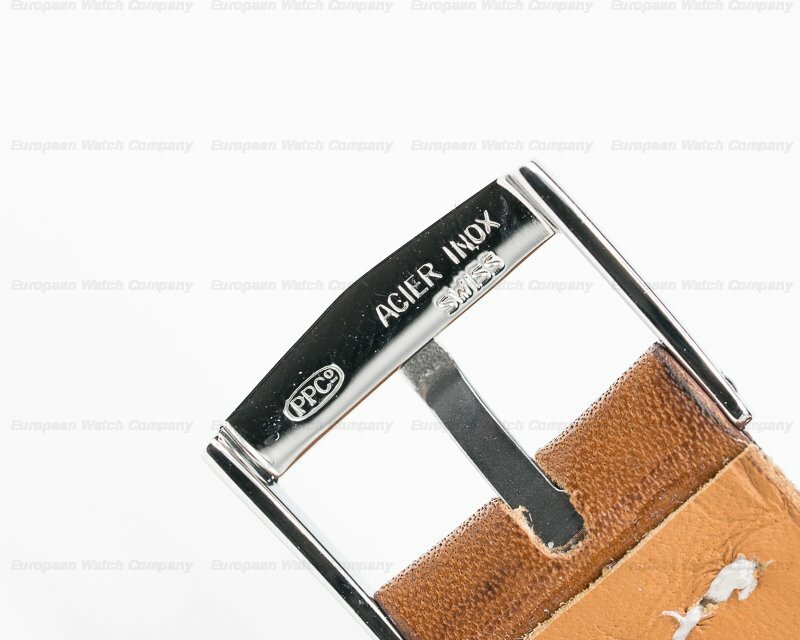 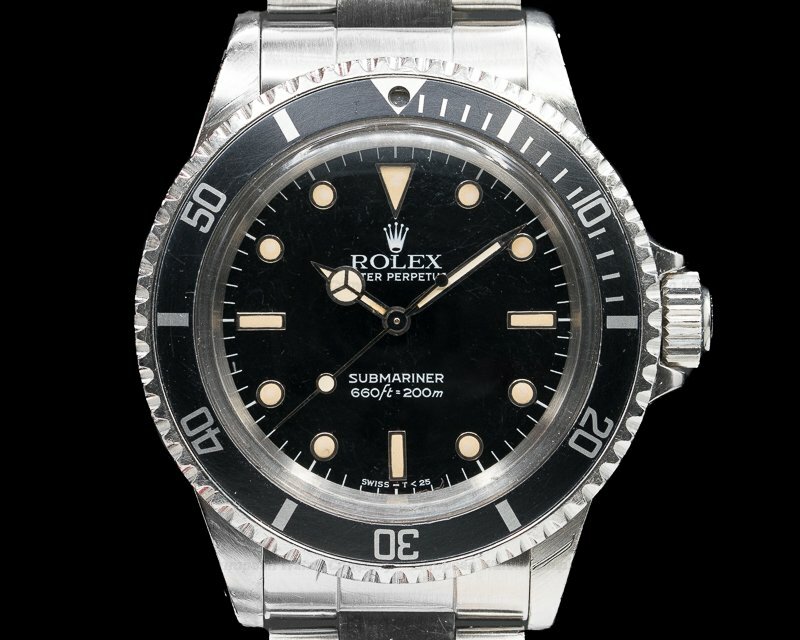 It's construced with 37 jewels, a shock absorber mechanism, and it's stamped twice with the Seal of Geneva quality mark. 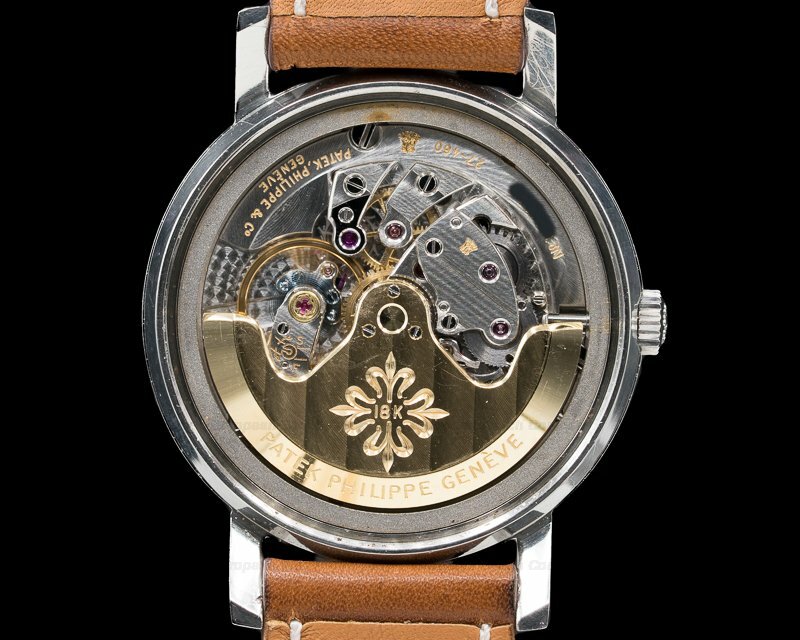 It includes a straight-line lever escapement, a patented Patek Philippe Gyromax balance that's adjusted to heat, cold, isochronism and 5 positions, a self-compensating free-sprung Breguet balance spring, and an 18K gold rotor engraved with the Calatrava symbol. 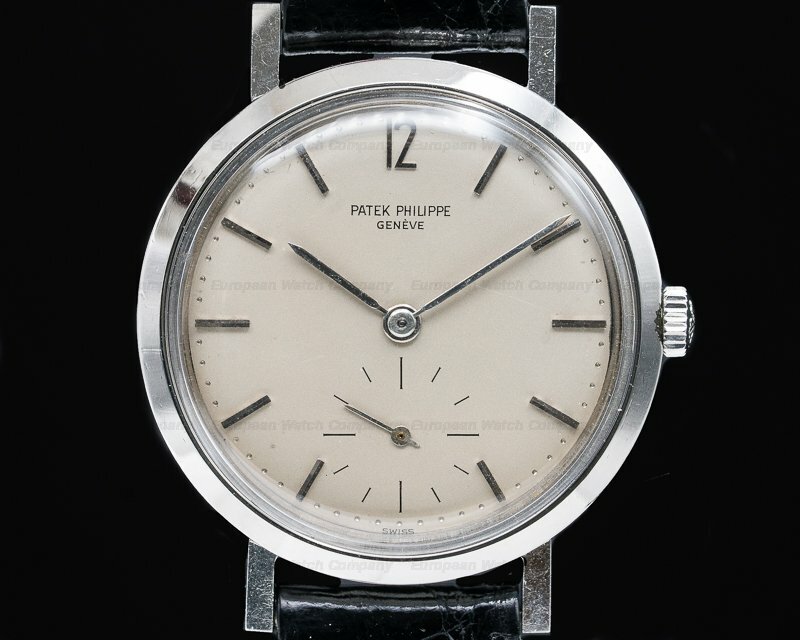 The Patek Philippe 3466 is very rare and is one of the few vintage stainless steel watches from Patek Philippe with an automatic movement.